How much will GDP be hurt by Trump’s protectionism? If HUD is abolished, will there be a growth dividend? I always respond with a giant caveat about economists being lousy forecasters, and I also warn that there are many policies that determine prosperity, which makes it inherently difficult to estimate the impact of one policy. But when pressed, I’ll toss out a number – say 2/10ths of 1 percent. And that type of answer almost always seems to disappoint the audience. It’s as if there’s a collective assessment that we shouldn’t waste time fighting for or against certain policies if the impact on growth is so trivially small. And if you’re planning on dying in the next six months, then maybe it isn’t worth it. In reality, though, even small differences in growth can make a big difference to prosperity if they can be sustained. This chart, which starts with the Commerce Department’s estimate of GDP for 2017 and is then adjusted for the Census Bureau’s population projections, shows how a “trivial” increase in the growth rate over the next 25 years winds up generating big increases in per-capita GDP. Maybe I’m not a big and bold thinker, but this kind of improvement is worth fighting for. 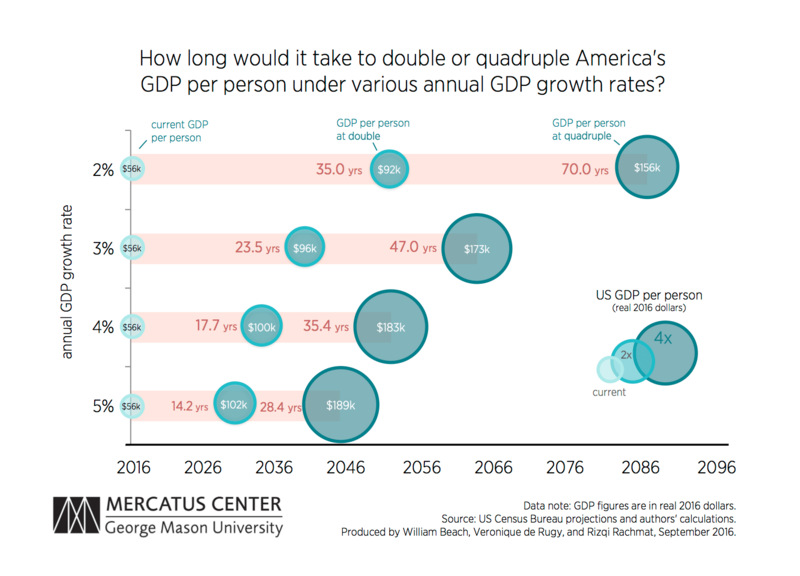 Back in 2014, I tried to make this same point with a chart showing how long it takes an economy to double in size based on different growth rates. It seems obvious that it’s better to be at the top of that chart, like Hong Kong and Singapore, instead of the bottom, like Italy or Greece. And Veronique de Rugy, in a column for National Review, shared a more sophisticated version of the chart. At the risk of stating the obvious, you want the big circles to happen faster. 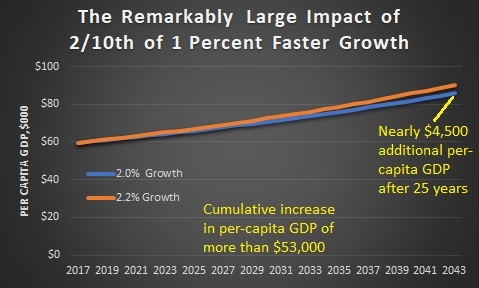 Let’s share one more chart, and I put it together because I’m sometimes asked about the potential impact on growth if all libertarian policies were adopted? Once again, I give a standard caveat about economists and forecasting. And I also explain the principle of convergence so the audience understands it’s more difficult for a rich country to achieve very high growth rates. But eventually I’ll speculate that an ideal set of policies might increase growth by 1 percent annually. Which, once again, doesn’t seem to impress people. 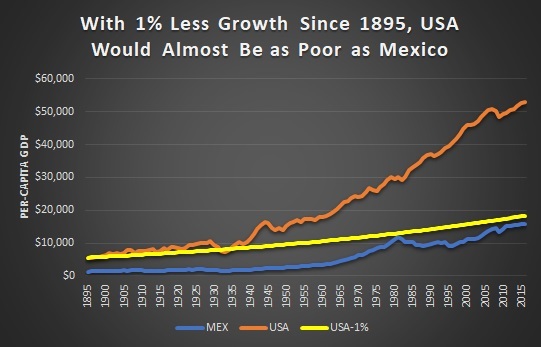 In the future, though, I’m going to share this chart, showing historical numbers for U.S. and Mexican per-capita GDP from the Maddison database, augmented by a second (yellow) line showing where America would be if per-capita GDP increased by one-percentage point less each year. In other words, an additional percentage point of growth may not sound amazingly impressive, but over time it generates amazingly impressive outcomes. The bottom line is that even trivial pro-growth reforms are worth the effort. Even if it takes a few years for the growth to materialize or if the growth only lasts for a limited period of time. on August 9, 2018 at 12:00 pm What Will Cause The Next Recession? I imagine that they (politicians) then ask amongst themselves: “How many extra (lemming) votes will an extra two tenths of a percent growth give me in next year’s election?” To which the answer is “virtually none”, while spending an additional two tenths of a percent in tax money (a much smaller dollar figure than the growth) will have some impact on his election prospects. So what does he choose? More importantly, what does the voter-lemming choose? Had humanity had an additional annual growth rate of two tenths of a percent in the last millennium, average world per capita income would be well over average American per capita income. More importantly such growth would not simply mean more money in the bank. It would mean that everything would likely be half a century ahead, and we would likely already be living in a world where e.g. cancer has been cured. In a sense, every person who dies of cancer in the next fifty years (billions) is a victim of past slower growth. That’s quite an impact I’d say. Even the roughly 6% difference over 25 years shown in the graph means that the cure for cancer will be delayed by 1.25 years (25y*0.05) every generation with the slower growth rate. So if, say, the cure for cancer is 50 years away then forfeiting 0.2% of annual growth will delay it by 2.5 years. How many extra people will die of cancer in the world in that 2.5 year span? Probably around 50 million. That alone is a whole WWII of victims and only counts one disease and does not even begin to count the economic benefit lost. And that is if the cure for cancer is only 50 years away. If it’s longer then the suppressed growth compounds to an even bigger impact. The impact is enormous either way. (*)Oh yes, “all previous forms of totalitarianism were wrong… but this one… this “green” one is the right one … if anything because it’s inevitable — the survival of the planet depends on it”. How easily does totalitarianism slide by voter-lemmings when it simply dresses a little differently. Voter-lemmings will drink the fruit punch … once again. PS. Perhaps many will not live long enough to see the impact of two tenths of a percent growth in their lifetimes. But their descendants will. That should be obvious in our era. PPS. I think that the structural annual growth rate trendline of a free market low regulation and 15% GDP limited government advanced economy will be around 5% in our era — with strong accelerating trend towards even higher growth as everything human is now irreversibly accelerating. My main long term task in this world is: Make sure my children are on this high growth vehicle and are not left behind suppressed by coercive collectivism, like most western world voter-lemmings will. PPPS. The average voter-lemming’s lack of understanding in simple arithmetic exponents is perhaps the single most detrimental educational omission of all time. Brilliant perspective. I have never really thought about how small percentages can effect in the long run…until I saw your graph. Thanks for the brilliant post, Mr. Mitchell.